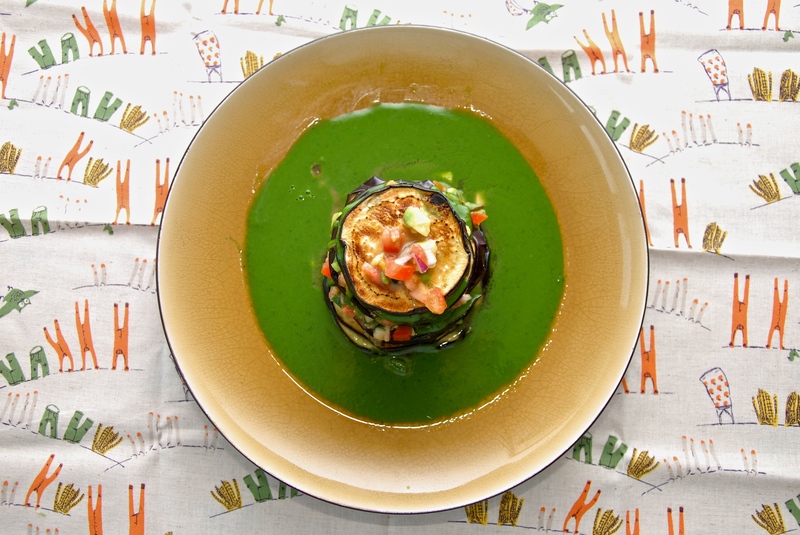 This is the fourth significant recipe towards the countdown. In a way it is one more tribute to my island. 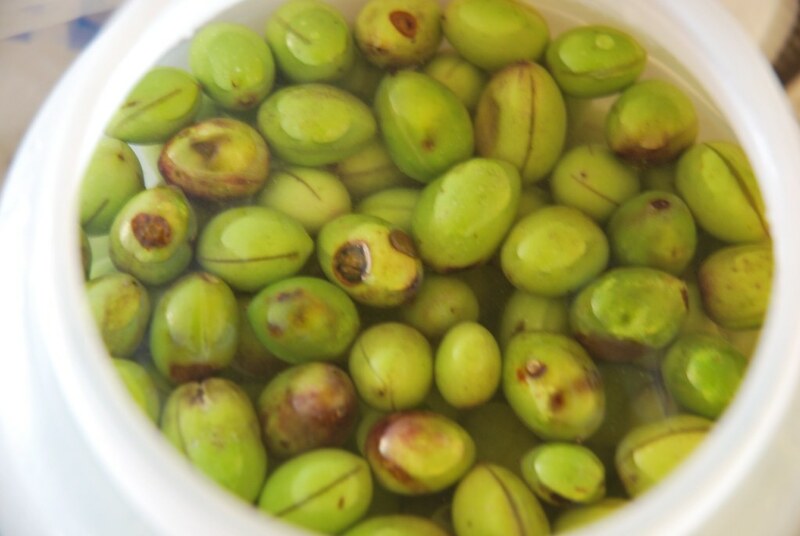 It is the traditional way we are curing the green olives. 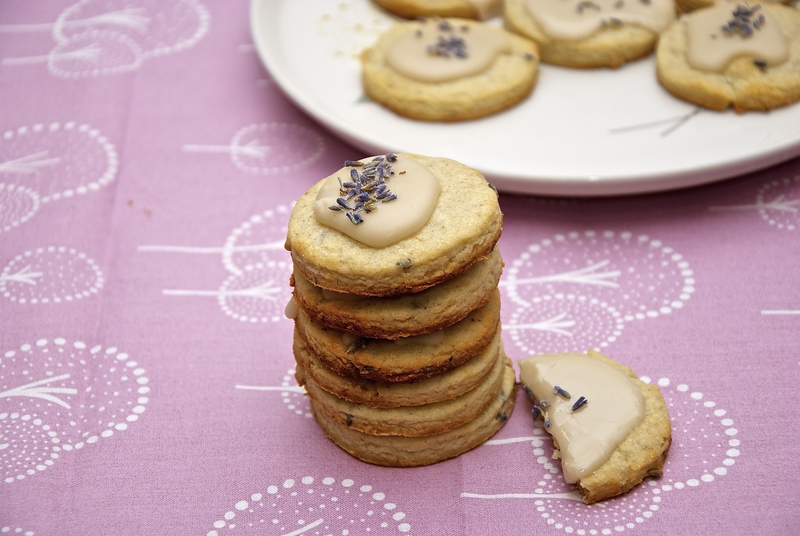 And this recipe is from my grandma. The one person that knows how to make them perfect. 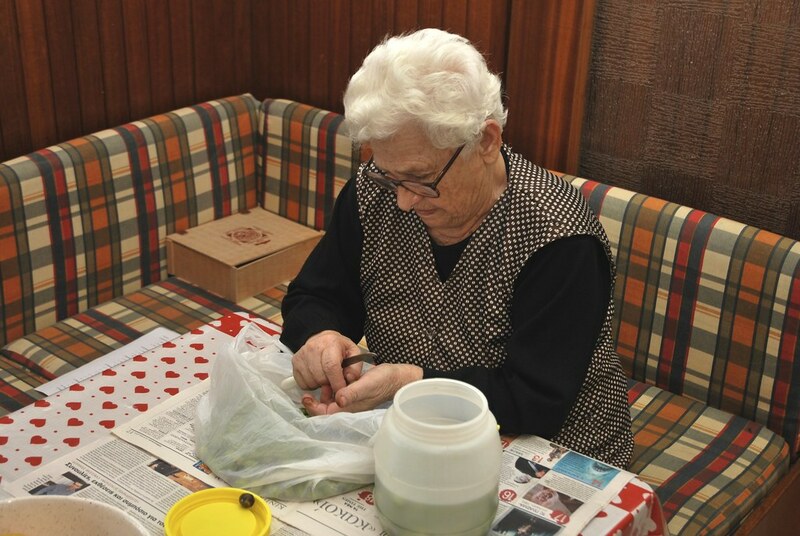 She is making them every year for more than 50 years. This particular variations in Crete are called tsakistes ( τσακιστές ). This means crushed. 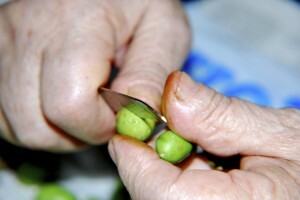 You used to take the olives, and crush then with a rock or a small hammer, enough to crack open the meat of the olive. More on why later. They are served with lots of lemon and sea salt. My favorite treat since I was a kid. Olives are an amazing front. First of all… Oh yes they are fruits. Etymologically speaking every plant that we consume exclusively a part of a flower that derives from specific tissues of the flower, mainly one or more ovaries is classified as fruit. That includes the tomatoes, zucchini, eggplant, etc. So olive is a fruit. A fruit that contains the highest percentage of fat than any other fruit. A fat that is currently the most commonly used cooking oil in Greece and the Mediterranean sea. Greece is first in consumption of olive oil and the island of Crete leads with 21 lt/person annually. I have already very detailed explained olive oil and its benefits here, so I will not dwell on it. I will just underline the historic significance of the olive, the gift of the ancient Gods to the land of Greece. So important that has been worshiped in every religion existed on Greece. According to the myth when the city of Athens was founded Athena (the goddess of wisdom) and Poseidon (the god of the sea) argued for the name of the city. They gave each one a present to the people of the city and asked them to pick their favorite. The winner will get the city named after him and be the eternal guardian of the city. Poseidon gave the city a giant fountain of unbelievable beauty and Athene gave the city an olive tree. She won, and Greece was never the same again. 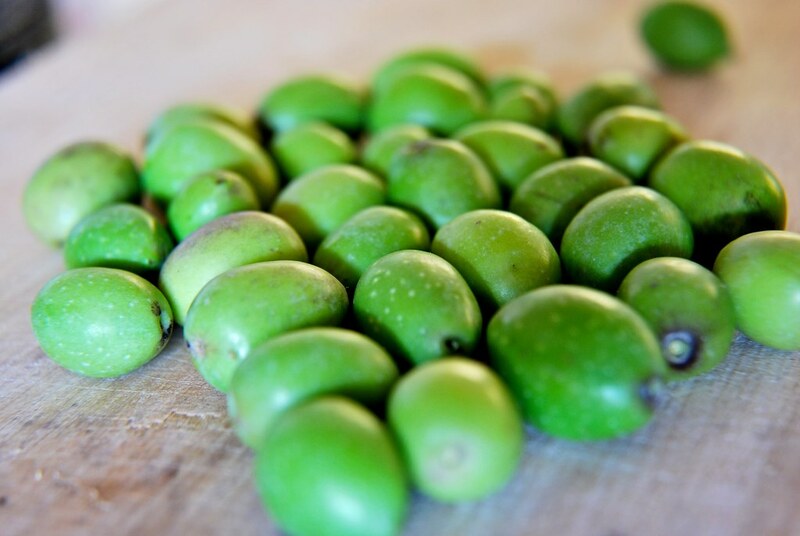 Although olive oil is the most common product of olives, olives themselves are very powerful as well. 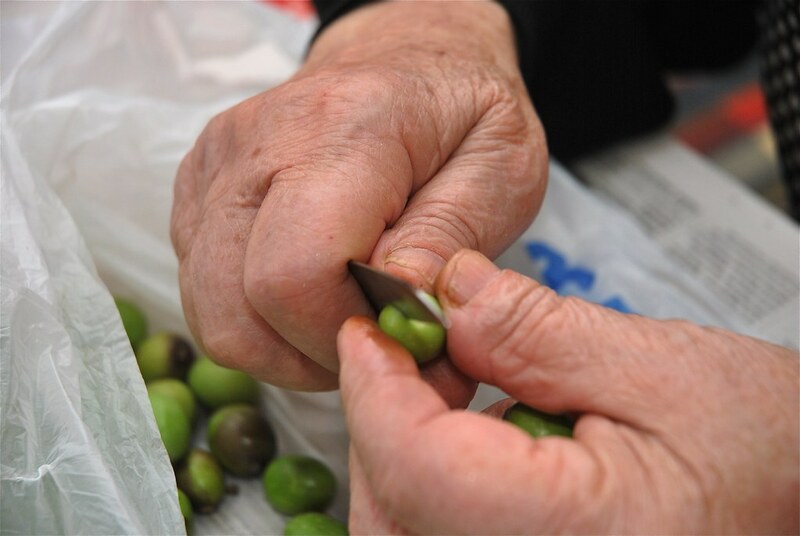 And usually people cannot wait to get their hands on the first olives of the season. 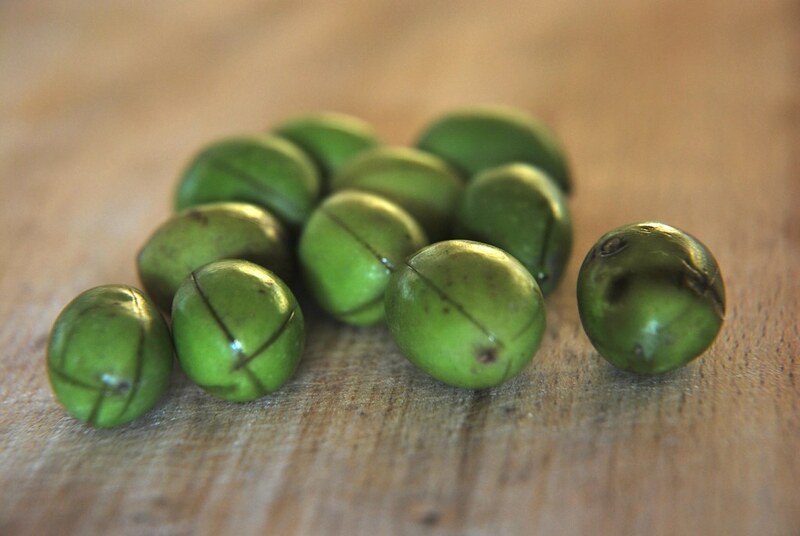 While still green early in Fall hand-picked then plumpest green olives for eating. It is a ritual. My grandmother, my mother, aunt and I with my cousins will go hunting for these olives in the olive gardens before the crew (my grandfather, my uncles and my dad) get to gather up all the olives. 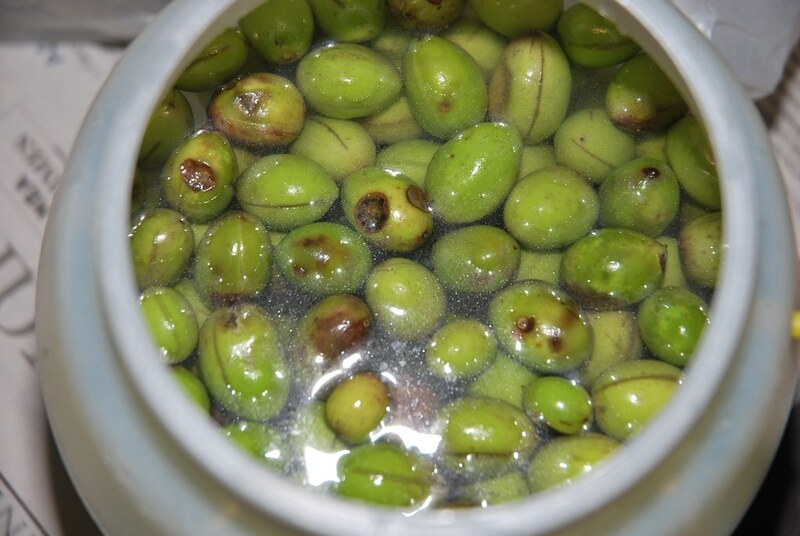 The olives will be then undergo a soak in water for month chaining the water every 2-3 days. The purpose of this bath is to soften and remove all the bitter taste of the olive. Olives are very bitter. Once that was done, they will be soaked in an acidic brine for another month before they are ready to be eaten. That ’s were these crashed olive recipe comes handy. Breaking the olives, makes the exchange of the bitter taste much quicker. Here we will see some of the steps and I will share my recipe for the brine. Yes short list. Olives and time. To essential ingredients. Although they are called crushed, my grandma rarely was crushing them. The crushing, can smash them, can break the pit, and if they stay too long in the water they get soft and mushy. So instead we cut them with a knife. I used my big knife. Not very good idea. The objective is not to get all the way to the pit. Just slice the olive meat. So as my grandmother said, just use the tip of the knife. The finger is used as a guard not ti get too deep. Make two to four incisions based on the size of the olive. 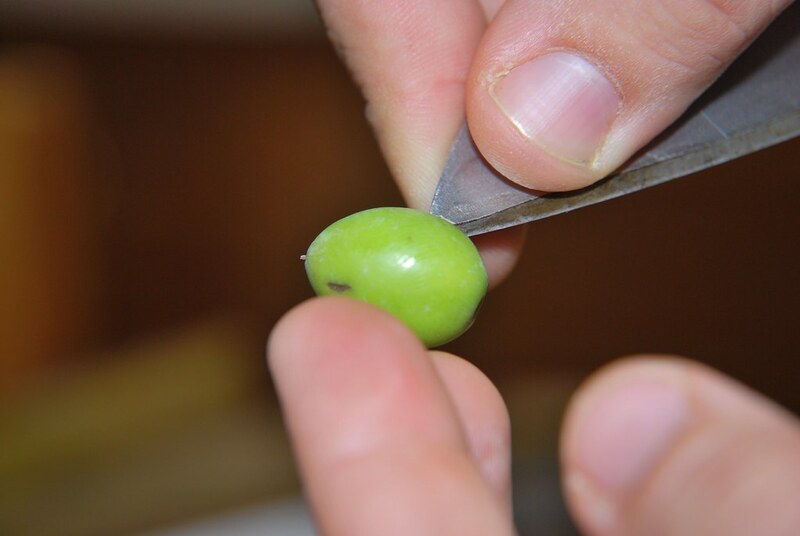 It is very normal to oxidize the olive in the incision area. Here you can see some of them. In the time i took me to finish these, my grandma finished all the rest. Here are my grandma’s skilled hands working full speed. Millions of olives have passed through these hands. And one more shot of the same hands. Place the olives in a jar with the water. Change the water each day for seven days. This is called the de-bitteration process. After a few days you will see some olive oil gathering on the top. Once this process is done we go to the curing process. For the curing process I have no pictures. Just the recipe. The old school way. Take water and add salt. How much? Well we said old school. As my grandma said, add enough water until an egg is floating. Ok (it is one cup of salt in a liter of water). Wash the olives and add them back in the jar. Follow that with the brine. Let them cure for at least 7 days. The final result is a little better than regular cured green olives. They are firmer, more oily and have a nice bitter aftertaste. They are served with lots of fresh squeezed lemon and sea salt. 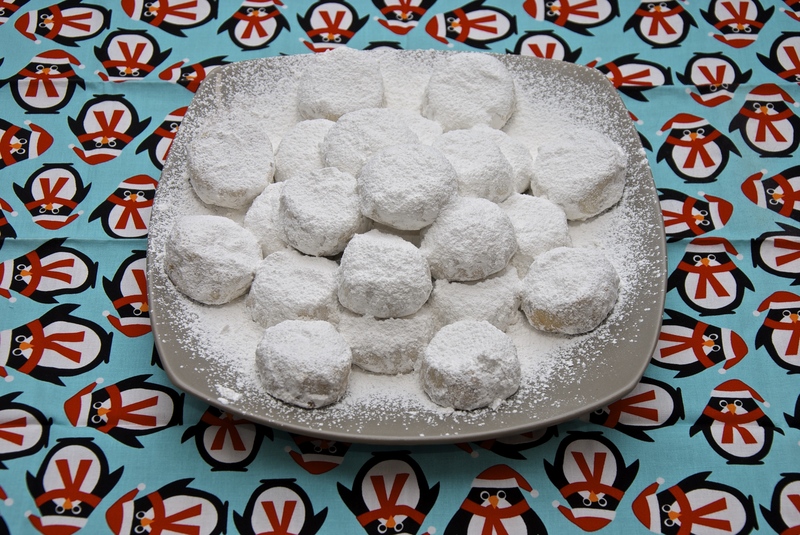 You can make them as many times as you want, but it will never get them as good as my grandma’s! I had that problem myself. So I decided to make my own recipe, to avoid the comparison with grandma’s recipe. It is just like the one that we just discussed with the addition of a few flavorings. So here is the recipe. Bring the water to boil, add the coriander, the salt and the bay leave. Let it simmer for 5 mins. Turn off the heat, add one lemon in slices, place the lid on and let it come to room temperature. Strain and proceed as before by adding the brine tot he rinsed olives. Add the second lemon in slices. This recipe makes for a more fragrant olives, but the lemony aroma is not overwhelming, and to some extend complimenting, the fine aroma of the green olives. And most certainly they are not vinegary, briny. 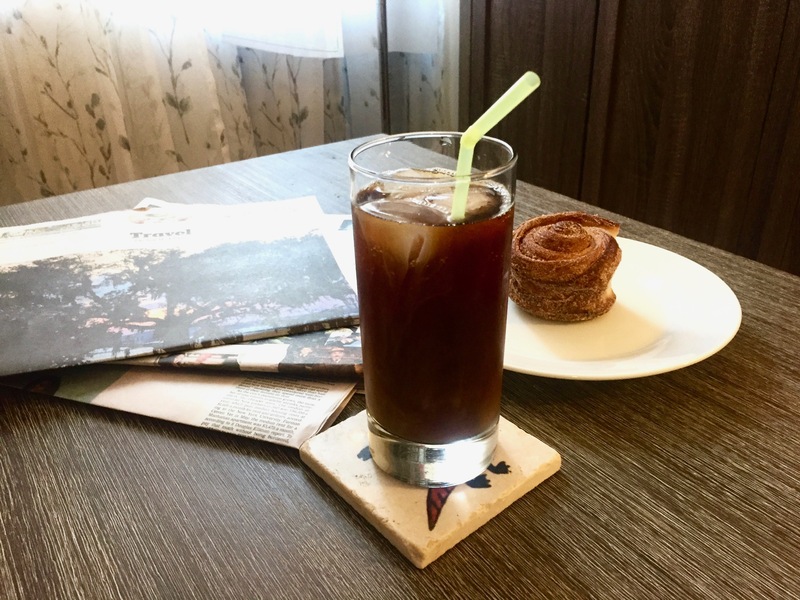 They are olivy… They are great. 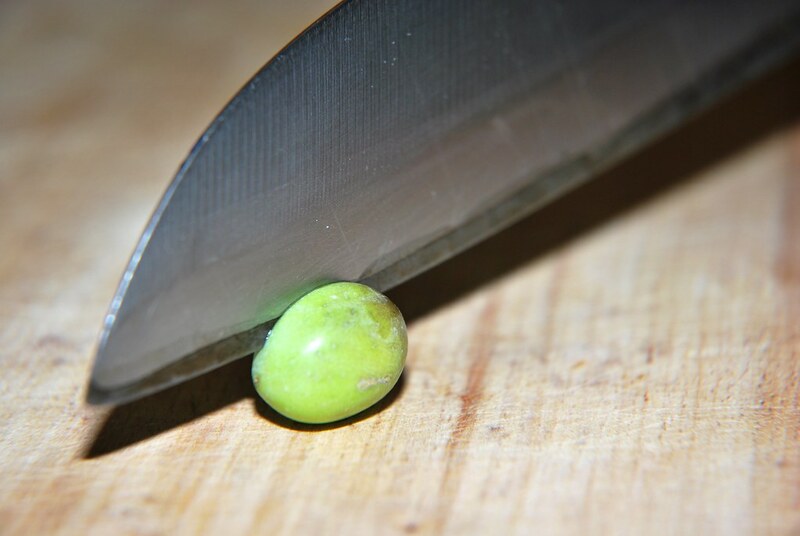 Score the olives with a knife at two or three sides, without getting all the way to the core. Mix the salt with the water until is dissolved. Add the olives in a container and cover them wit copious amount of water. Change the water every day for 7 days. After 7 days bring clean water to boil. Add the coriander, the salt and the bay leave. Let it simmer for 5 mins. Turn off the heat, add one lemon in slices, place the lid on and let it come to room temperature. Strain and proceed as before by adding the brine tot he rinsed olives. Add the second lemon in slices. This recipe makes for a more fragrant olives, but the lemony aroma is not overwhelming, and to some extend complimenting, the fine aroma of the green olives. And most certainly they are not vinegary, briny. They are olivy… They are great.